Douglas Porch. Counterinsurgency: Exposing the Myths of the New Way of War. New York: Cambridge University Press, 2013. ISBN: 9781107699847 (paperback, $27.99). Reviewed by Jacqueline L. Hazelton, Department of Strategy and Policy, U.S. Naval War College. 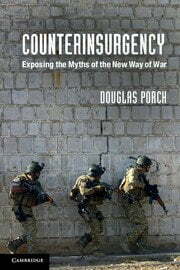 In Counterinsurgency, Porch engages with the contemporary narrative of COIN success as a process undertaken by a great power, primarily through its military forces, to introduce good governance within a client or colonial state in order to defeat an insurgency challenging the legitimate ruler. This narrative emerged most recently in the mid 2000’s as the U.S. Army’s solution for the soaring violence in Iraq and, later, in Afghanistan. Porch argues that this narrative is neither new nor accurate. In the strongest terms he condemns COIN in centuries past and today as a high cost, low reward effort that degrades the states and militaries that conduct it and deprives its local subjects of life, liberty, and dignity. Porch characterizes today’s COIN orthodoxy in the form of military doctrine as “an outgrowth of the belief, common in 19th-century France and Britain, that military action provided the mechanism for the dissemination of modern, Western values and attitudes as a foundation for indigenous governance and social, political, and economic transformation of pivotal regions” (1). Trying to nail down COIN orthodoxy is a slippery task. Scholarship on COIN since World War II is neither internally consistent in its analysis of conditions and prescriptions for success nor consistent among works by authors who advance similar ideas. In this practitioner-dominated literature, there is also resistance to theorizing that might engender a more systematic understanding of the processes of COIN. This resistance often appears as the paradoxical assertion that every COIN campaign is different and that good governance is what defeats insurgencies. Porch challenges this COIN orthodoxy across the board, on fact, on assumption, and on the claim that every case is fundamentally different and yet good governance is the antidote to insurgency. He does so by providing a detailed look at the history of COIN from its nineteenth-century conceptualization as a type of warfare (see, for example, 12, 97, 126). He analyzes German, French, British, and U.S. campaigns that readers may recognize (Malaya) and that many may not (the German slaughter of the Bantu Herero people of what is now Namibia). Across cases, he identifies the pathologies of COIN, including its creation as a special category of war intended to serve the interests of expeditionary military forces; threat inflation by these forces as they seek status and resources by fighting small wars; the stab-in-the-back narrative that these forces develop when their tactics fail to solve the political problems of empire and their political masters pull the plug on their adventures (see, for example, 152, 177, 222); the viciousness of COIN tactics targeting civilians; and the distorted cultural and racial views of indigenous cultures inherent in the COIN narrative. The debate over COIN and its broader goals and assumptions — what works and what does not, costs versus benefits, and its wisdom as a policy choice for great powers backing threatened clients — is not new. The current debate, to which Porch is responding, heated up with the insurgent challenge to the United States in Iraq, started boiling with the 2006 publication of the U.S. Army/Marine Corps COIN manual as a trade paperback as well as military doctrine, and has continued to simmer with periodic outbreaks of strong feeling on all sides. Emotions run high because reputations and careers are at stake along with the interests of the United States and its friends and allies, not to mention the lives of those most directly involved in these campaigns. Most recently the debate has taken place within the context of lessons learned from the U.S. experiences in Iraq and Afghanistan. If the so-called ‘COINdinistas’ (supporters of the good governance approach to COIN) are correct, then the United States should be making institutional changes in its military and civilian arms of government to more effectively conduct COIN operations in a future of peripheral wars against weak, probably non-state opponents. If the so-called ‘COINtras’ (opponents of this view) are correct, then the United States must recognize the many flawed assumptions embedded in its doctrine and in widely held views about the process, value, and likely outcomes of intervening militarily in clients’ COIN campaigns. All of the issues and questions analyzed in this study underline the requirement for historians as well as those makers of policy concerned with the essence of contemporary conflict to continue to establish the factual record so that mythologized, self-serving versions of the past are not offered as a grand strategic formula for the future. … Such an abuse of the record of the past as the basis for professional and institutional imperatives can lead to people getting killed …. (338). He attributes to several factors the persistence of the myth that good governance drives COIN success, including proponents’ misuse of the historical record (see, for example,44) and the contemporary neo-conservative and liberal interventionist belief in the efficacy of military force to effect social and political change within other states and societies (332). The COIN narrative has always been a marketing tool used to conflate national interests and military ambitions (341). “Small wars spokesmen marketed humble, back-of-beyond outposts as strategically vital pieces of real estate coveted by other European powers” (44), Porch writes, warning that the narrative corrodes the very militaries that advance it (see, for example, 172, 192, 317). The book opens with a prologue identifying the political concerns that Porch argues led military officers to promote small wars as a specialized realm. These nineteenth- and early twentieth-century French and British officers needed to rally political and popular support for their political projects overseas (1) as concerns rose “about the barbarity of small war tactics and operations and questions about the risks and utility of imperial expansion” (2). He identifies one of the fundamentals of contemporary COIN, “the idea of counterinsurgency is linked to democracy, and the notion that a government’s legitimacy is anchored in the consent of the governed” (3). Prior to the rise of modern, democratic ideals, terror served as a deterrent against colonial uprising, but in the modern era “the occasional massacre no longer seemed compatible with democratic humanism … rather than as patterns of racialized violence endemic to small wars” (3). Part of this marketing effort involved what Porch calls “rebrand[ing] rough methods of conquest and exploitative governance as an extension of ‘soft power’ that benefited the governed (and flattered the West’s sense of cultural hubris)” (2). Further challenges to the widely seen assertion that counterinsurgency is a specialized, more sophisticated form of warfare, the graduate level of war, are threaded throughout the book. COIN was different in the nineteenth century, Porch notes, but not in the positive ways touted by its proponents. In fact, it was “the deployment of indiscriminate violence against noncombatants [that] went against the trends of continental warfare, which saw combat as an activity led and managed by professional soldiers to achieve the more or less limited political goals of sovereign nation-states” (21). The proponents of COIN, furthermore, have embraced small wars “as a refutation of modern, intellectual, more strategically sophisticated analytical and technological approaches to warfare” (50). Worse, today’s doctrine is deterministic and anti-Clausewitzian in its belief that tactics will inevitably prevail no matter the political interests at stake, and “it denies the interactive nature of conflict as manifest in the will, chance, and anger of conflicting parties as in the duel” (303). One additional important theme is Porch’s unpacking of the COINdinistas’ belief in the power of cultural knowledge. He sets the stage for the advancement of this belief in contemporary wars by tracing in detail the British and French imperial experiences. “While the British in particular convinced themselves that their impartiality and probity informed by cultural sensitivity gave them legitimacy both at home and in country, in fact it often meant imposing incomprehensible decisions on the locals behind an imaginary facade of cultural knowledge” (33). These “recreational cultural connoisseurs,” in Porch’s brutal phrase, survive today in the creation of U.S. Human Terrain Teams by a military “whose soldiers tend to be at best suspicious, when not totally contemptuous of the cultures of the populations they are tasked to control” (329). Rather than requiring and reflecting deep cultural knowledge, Porch argues, contemporary COIN requires that “non-Western societies exist in a time-warp which the adoption of Western practices like democracy, rule of law, and capitalistic competition will allow them to overcome” (58). Porch sweeps sometimes breathlessly through history, moving back and forth between conventional and small wars to build his argument about the roots of COIN myths. From the Franco-Prussian war of 1870 to global French conquests to the rising intra-military divisions between small warriors and continental warriors and the small warriors’ resulting politicization (47-51); to debunking the myth of the efficacy of the French oil-spot tactic of spreading “security” in Indochina and North Africa (54-55); and transforming the narrative of colonial strategic successes into the reality of “an opportunistic Orientalized reliance on compliant or unsavory local collaborators ….” (60), Porch’s sweep is broad and his command of detail indefatigable. By the late nineteenth century it is time to bring the Americans into the picture as well, with the “moral ambiguity and brutal tactics” of their Indian Wars taken overseas to the Spanish-American War, where in the Philippines U.S. officers learned that “‘this business of fighting and civilizing and educating at the same time doesn’t mix very well’” (64). The reader is whisked on to the Second Anglo-Boer War, the Germans in Africa, the French in the Middle East, World War I, the rise of people’s war against imperial rule in the interwar period, and the British experience with World War II-era insurgencies [where the vaunted concept of limited force meant aerial bombing, shelling, and burning of villages, the poisoning of wells and destruction of food stocks and livestock, the execution of the wounded, and the forced movement of populations (131)]. Porch considers the use of partisan forces in World War II, the post-war collapse of the French state over squalid military efforts in Indochina and Algeria, Mao Zedong’s success in China, and the mythologizing of and by David Galula, once an obscure French army major and today a leading inspiration for U.S. COIN doctrine (175-198). Porch eviscerates Galula’s narrative of successful COIN tactics in French Algeria, noting that the insurgents won, as they did in French Indochina. He discusses how Galula “sanitized” the French tactics of torture, the forced movement of communities, and the imprisonment of populations into a myth of efforts to “‘reassure, support and control the population’” (175). He further excoriates Galula as a salesman attempting to “parlay his Algeria experiences into a steady job in a country whose faith in the universality of its values requires it to formulate a doctrine to operationalize its vision” (197). From Algeria, Porch moves to the U.S. campaign in Vietnam, then to U.S. and European support for Latin American states challenged by guerrillas, and returns to the familiar story of the special British success with COIN, which recent scholarship cited by Porch has effectively challenged. Galula and the French war in Algeria, along with the U.S. experience in Vietnam, highlight Porch’s exploration of the stab-in-the-back myth constructed by COINdinistas to explain the failure of their tactics across space and time. “The COIN-dinista mantra is that the counterinsurgency formula invariably succeeds if it is not hijacked by conventional soldiers or sabotaged by impatient governments and peoples” (177) he writes. The COINdinista insistence that had doctrine only been applied properly in Indochina, Vietnam, and Algeria, the great powers would have won, is, Porch writes with typical gusto, “highly suspect for no other reason than that it celebrates a COIN-dinista pantheon filled with losers and sometimes war criminals who claimed that they were winning on their front and could have won the whole enchilada but for a government/people/conventional military establishment that knifed them in the back” (162). Thus, while COIN efforts are en train, “they must always hover on the cusp of success — COIN as a ‘process,’ ‘a rising tide of security,’ ‘seizing/breaking the momentum,’ or ‘this is the decisive year/month/week’ …” (334). These are the great myths of COIN that Porch wants to banish: that COIN is about helping people; that COIN is a unique form of warfare requiring specialized skills, including deep cultural understanding; and that COIN is less costly than the policy alternatives. Most fundamentally, he wants us to understand that our beliefs about the processes of COIN and their efficacy have been manufactured out of whole cloth rather than based on the historical record. Porch insists, again with painful accuracy, that the moral and material costs of COIN are high. Small wars rarely turn out to be so for the great power involved. “Most proved to be protracted, unlimited, murderous, expensive, total-war assaults on indigenous societies” (50). Today, Porch argues, in the battles that have followed 9/11, “small wars are long, dirty affairs fought most often in remote places among peoples little inclined to see the arrival of Western forces as liberation. Even when they are achieved, military victories in small wars seldom come at an acceptable political, diplomatic, legal, moral, and financial cost” (327). This is a rich, well supported study of a tendentious topic. It does not break new research ground, but it pulls together material on a remarkable variety of cases to make a powerful point that is valuable in the undergraduate and graduate classroom as well as for broader practitioner and public audiences. It is true that readers not intimately familiar with the COIN debates may find themselves lost in the details of cases or disconcerted by Porch’s sometimes inflammatory language. Porch paints with a broad brush and is short on political analysis of any state interests beyond logrolling. For the purposes of this book, Porch is a lumper rather than a splitter. He combines all sorts of campaigns against insurgents and terrorists in a variety of contexts. This bolsters his argument by the sheer mass of evidence that he produces. It also invites finer-grained investigations into COIN outcomes, COIN strategic choices, the narratives of COIN, and logrolling within contemporary expansionist states. Porch’s book raises awareness of the costs of choosing to fight a war for an opaque political objective while using the military as the primary tool when it may not be best suited to the task. Porch’s book makes important corrections to the historical record and should powerfully inform the policy debate. Jacqueline L. Hazelton is a Professor of Strategy and Policy at the U.S. Naval War College. Her interests include compellence, asymmetric conflict in the grand strategic context, military intervention, counterinsurgency, terrorism, the uses of military power, and U.S. foreign and military policy. She is writing a book on success in COIN. See, for example, Robert A. Packenham, Liberal America and the Third World: Political Development Ideas in Foreign Aid and Social Science (Princeton, NJ: Princeton University Press, 1973); D. Michael Shafer, Deadly Paradigms: The Failure of U.S. Counterinsurgency Policy (Princeton, NJ: Princeton University Press, 1988); Douglas J. Macdonald, Adventures in Chaos: American Intervention For Reform in the Third World (Cambridge, MA: Harvard University Press, 1992); and Benjamin C. Schwarz, American Counterinsurgency Doctrine and El Salvador: The Frustrations of Reform and the Illusions of Nation Building (Santa Monica, CA: RAND, 1991). Important revisionist work on COIN includes Karl Hack, “‘Iron Claws on Malaya:’ The Historiography of the Malayan Emergency,” Journal of Southeast Asian Studies 30:1 (March 1999), pp. 99-125; Karl Hack, “The Malayan Emergency as Counterinsurgency Paradigm,” The Journal of Strategic Studies 32:3 (June 2009), pp. 383-414; Karl Hack, “‘Everyone lived in fear,’ Malaya and the “British Way in Counter-Insurgency,” Small Wars & Insurgencies 23: 4/5 (2012); Paul Dixon, ‘“Hearts and Minds’? : British Counterinsurgency from Malaya to Iraq,” The Journal of Strategic Studies 32:3, pp. 383-414; and Huw Bennett,” ‘A Very Salutary Effect’: The Counter-Terror Strategy in the Early Malayan Emergency, June 1948 to December 1949,” The Journal of Strategic Studies 32:3, pp. 415-444.